Why do I recommend ripper for fishing for zanders? There are lots of different lures on the market, their amount may sometimes embarrass inexperienced angler. In the fishing world there are lots of spinning lures which can be used when fishing for zander. Nowadays soft lure, under the generic name ripper becomes more and more popular. It is because the fact that the kind and the shape of this lure is proper for fishing in many techniques. Its aggressive action, in some models action based on slow mirroring, sometimes brings great results, which are impossible to achieve with another types of lures. Compared to woblers or spoon lures, soft rippers are easy to lead in the depths, near the bottom or even slow and easy near the water surface. We can say that this is a universal lure for a trained spinning angler. I have to tell you that during fishing in different waters, known or less known, I generally use ripper. Spinning with rippers you can use many techniques, ways or tricks of presenting the lure. My favourite are jigging, bend in the bottom zone and vertical leading - ripper is perfect for these techniques. The fans of trolling or jerking will love it too. When fishing for zanders it is worth to hit the bottom with the soft lure quite often or often lean it on the bottom what is easy to be felt on the rod. Only this kind of fishing gives better results. 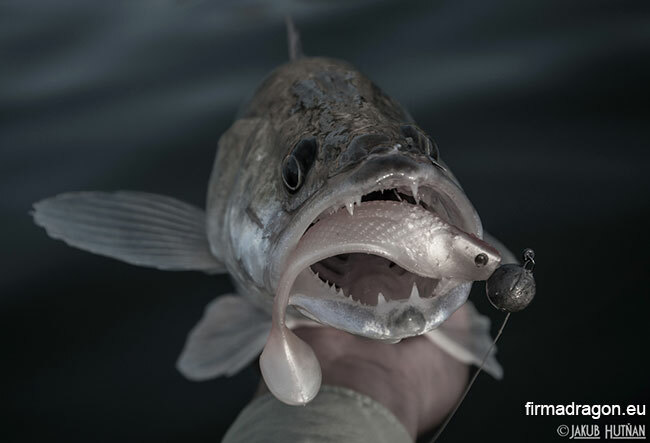 In the mentioned decent technique the lure should move and as often as possible touch the bottom. This effect can be achieved by energetically winding up the line on the reel or sensitively jerking by the tip movements - in such moment the lure rises on a few or several dozen centimeters - or if we wish, on meter or more. When the ripper rises in the water, slowly lower it in the direction of the bottom or on the bottom. The line has to be tight to keep in contact with the lure. What to choose, line or braid? When you fish for zanders it is better to choose a braid. To be objective I have to say that the line which is used in the river, in strong current, amortize the fight better. Strong current helps the fish which is fighting on the rod; the fish puts more resistance and tries to escape more often. This is the moment when the line affects the final result better than a braid. Using a braid and not having a proper rod, fighting dynamically with a fish we may be sure that we will lose it. Such situation may occur when we will use very fast spinning rod for the braid. It happens that experienced angler will deal with this situation but anyway, it will be better to adequately prepare the fishing rod. Spinning from the shore, using the descent technique, I use the braid 0.14 - 0.18 mm. To the vertical technique the best is the braid 0.14 mm, with reservation that when fishing from the boat you don’t have to use very strong braid. The thick braid disturbs your fishing, its thickness puts a lot of resistance in the water, in river or lake current the thick braid gets the lure away from the boat, what enables efficient fishing. For spinning fishing I use leaders, also fluocarbon. This is the way how I protect myself from losing the lure on sharp things or sharp pike’s teeth. Zanders appreciate the anglers when they take soft lures with lots of colours on the fishery. Of course a lot depends on the fishery, when we find it, and we know that we will find there lots of zanders, there is no sense in taking three boxes with colour soft lures, we just need 2 or 3 colours tested on a given fishery. What colours to take? Vivid and very dark colours are more effective in cloudy waters. In crystalline waters, where you can see the bottom, I prefer to use so called natural colours. I know such a fishery with crystallic water, where the zanders don’t bother vivid colours. An additional factor that influences the choice of colour is the season of the year. Zander is a predator which prey for the food which is available in a given season of the year. 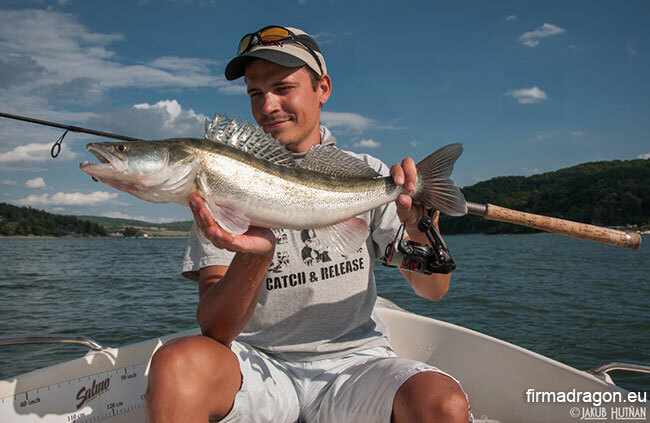 during summer time it prefers smaller lures such as 4 - 8 cm. During very hot days, and even during first days of Autumn I use bigger lures, such as 9-18 cm. Autumn zanders attacked the soft lures length close to 15 cm, they put them into mouth without any problems. During Autumn time zanders prey quite intensively because they want to accumulate fat and energy store. How to start fishing for zanders? Believe me, that many anglers cannot use spinning technique, either classic, from the descent or verticall, when fishing for zanders. It is worth to learn because they are very effective techniques. 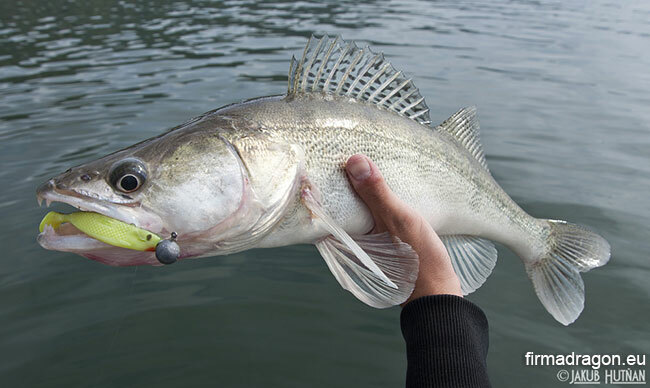 Zander’s bites can once be delicate and another time we will feel it like very aggressive hit on the rod. The characteristic feature of fishing for zanders on the deep fishery ( below 7 m ) is the necessity of hook set, what is really important when using the line. When it comes to braid such strong hook set is not necessary. 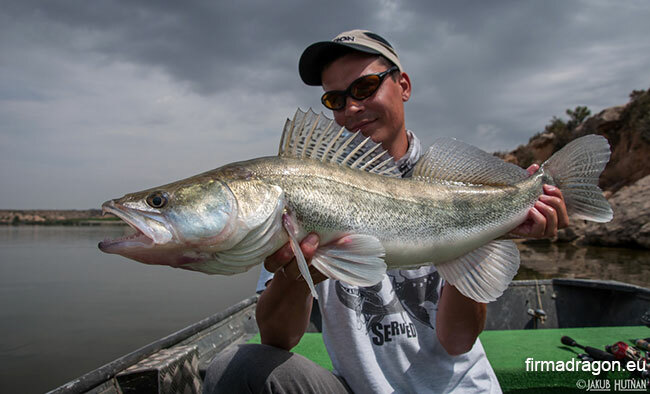 At the moment of attacking the lure, zander immediately feels that it has something unyielding and “ tough “ and at this moment the zanders turns around and swims in another direction - this is a perfect moment for the angler to energetically raise up the rod. The fact that the braid is not elastic helps in effective hook set. When it comes to line, the elasticity is much bigger and that is the reason when you have to be careful with the necessary power which you have to put in hook set and longer swing with the rod at that moment. At what depth you should be loking for zanders? This experience I have from mine and Spanish fisheries. 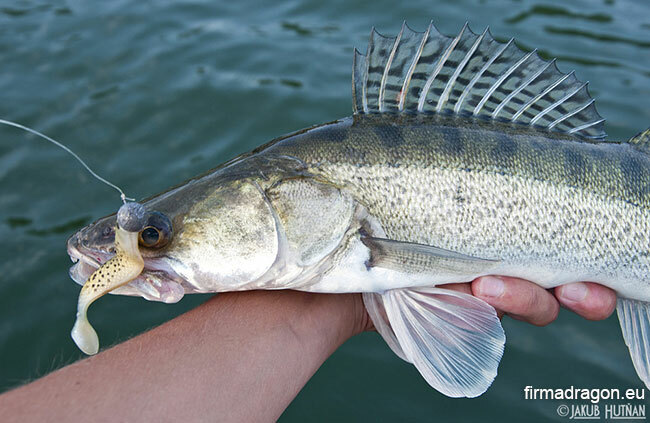 During hot days zander can be found on the bottom in the shallow part of the fishery, the depth where the angler can find them is between 1,5 and 5 m. After very hot day zanders prey mainly near the river bank, even in 50 cm water. It is a rule that during autumn time zanders group together on slightly greater depth, something about 7 - 15 m. Of course there are exceptions, it depends on many factors. In my deep fisheries I fish for zanders during autumn time, even at a depth of 2 m. Fishing in cold season you have to check the depths for the presence of zanders. You can use the spinning rod which you like, to a large extent. One anglers like fast or very fast rods and another ones like slow rods. Fishing from the boat we have more freedom in choosing a rod. For anglers who fish from the shore I recommend Fast rod, because such action increases the chance to catch a fish. The speed of a rod should be adjusted to the depth of the fishery. The deeper we fish, the faster rod we need. The fastest are marked X - Fast. With such a fast rod you can catch even the biggest zander. It is worth to pay attention on the length of the rod. During fishing from the shore the best spinning rod with the length of 2.45 - 2. 70 m. I met the fans of the length of 300 m, but honestly, it is not easy to fish with such long rods, and not every angler will be able to do it. But using 3 m long rod for special tasks, which means checking new, very difficult fishery is very advisable. For fishing from the boat, on the river or lake, I recommend short spinning rods - 180 - 210m. Using long spinning rod from the boat may cause problems, during the moment when the fish lands on board, the tip is dangerously bent and it can break at any moment. It is easier to do it with a shorter rod.